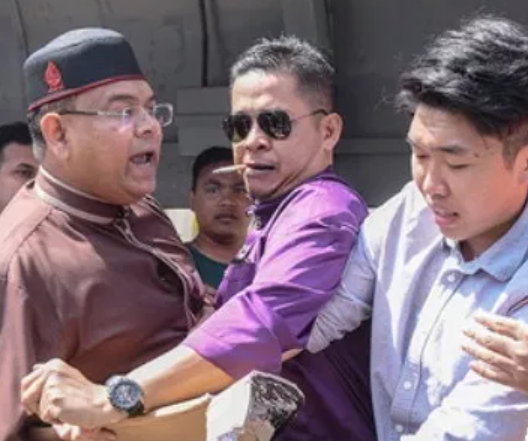 A scuffle broke out between six UM (Universiti Malaya) students and UMNO supreme council member Lokman Noor Adam during a small protest outside a restaurant near UM last Friday. The UM students were protesting about the Najib’s 1MDB financial scandal and the disappearance of RM 2.6 billion. Wong Yan Ke, UM undergrad from the University of Malaya Association of New Youth, was manhandled by Lokman for holding up a sign showing a picture of Najib edited to look similar to a clown. In a video posted online, it’s seen that Lokman walked across the street and snatched the sign off Wong after a little scuffle. Lokman proceeded to shred the sign apart while Wong shouted that it was his right to protest. In which Lokman responded, shouting why not use a picture of Mahathir instead. In the midst of the fight, Wong was reversed choked by other UMNO members over a railing while Lokman attempts to slap Wong. Despite that, it’s also been reported that several other UMNO leaders tried to stop Wong from being beaten up. Depicted in the video, an interview later witnessed Lokman saying he wouldn’t care if the sign was the face of Tun M, Betty (Chew), or Lim Guan Eng. At the moment, Lokman refused to apologise, saying to him, the request to say sorry was humorous he wanted to laugh out loud. On backing up his claim on a peaceful protest, Wong cited his previous protest against Minister of Education Maszlee Malik when he was appointed as the president of IIUM (International Islamic University of Malaysia). Although students Asheeq and Siti Nurrizah were arrested for trespassing, they were quickly released with the help of Maszlee, who voluntarily resigned after. Standing on the side-line of the incident, Najib responded saying the UM students were at fault for planning the provocation by holding the sign. Najib says he regrets what’s happened and questions his own safety when giving a speech. After being whisked away to the police station for safety concerns, Wong, accompanied by lawyer Vinesh Nuthal lodged a police report against those who assaulted him at Pantai Police Station. What’s left now is for police to carry out an investigation about the incident. Next Nurul Izzah’s resignation: weakness or principles?